- Quick re-call of recipes and conrmation of dosing,with all dosing operations visualized in the screen. 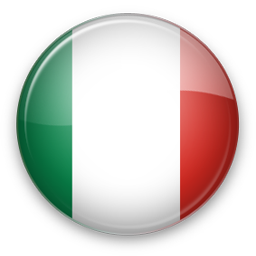 - Eventuale calibrazionedei coloranti (per quelli che presentano peso specifico). 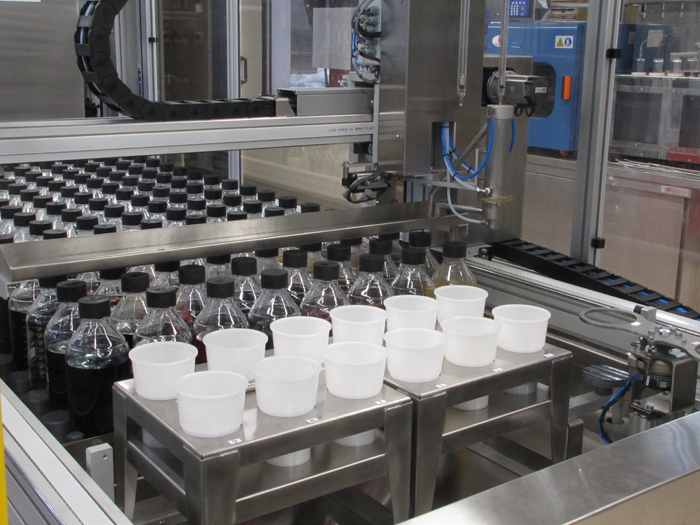 All the bottles, with the solutions inside, are equipped with stirring capsules, driven by magnetic induction. It is also possible to make the solution preparation process completely automatic, connecting PPA with our MP unit (automatic system for solution preparation), to renew the expired solutions. - Accuracy of the volumetric dosing: +/- 0,01 cc. 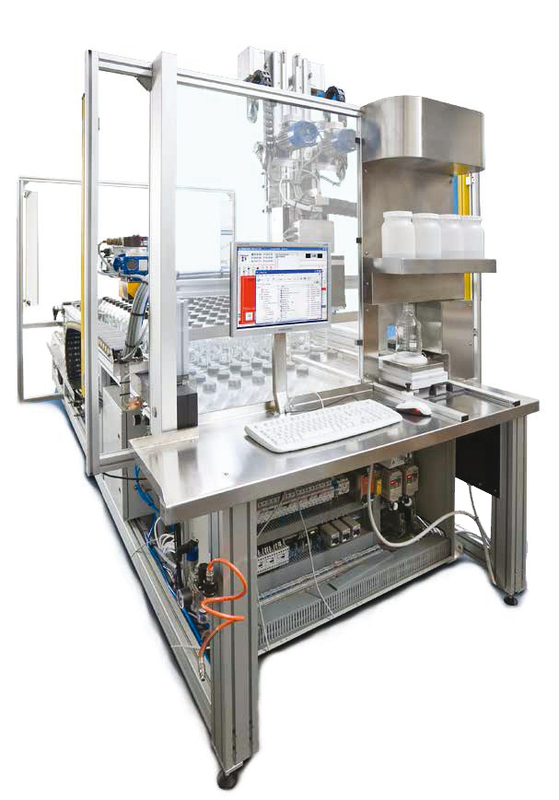 - Self learning system for the progressive improvement of the dosing cycle, singularly for each solution. 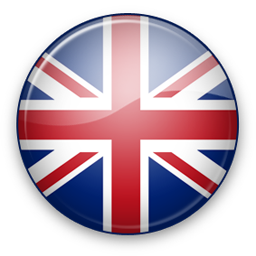 - Dispensing speed: up to 180 dosages per hour that means that supposing that one recipe needs 4 different solutions we can produce about 45 recipes/hour. - Amount of solution that the injectors can take in once up to 35 cc. - Fast and accurate calibration process in 60 seconds. 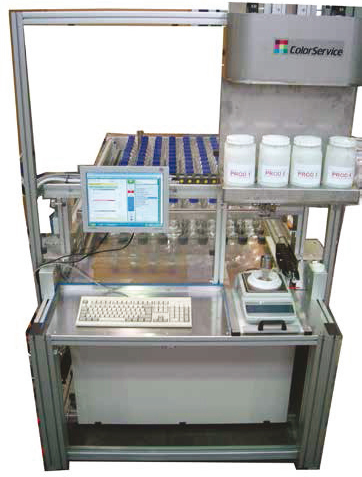 Default configuration of PPA is with Pirex 120 bottles by 1 lt. Volume capacity and refractory glass Machine frame can be adapted increasing/decreasing the total number of bottles with multiple of 8. The recipes are dosed directly into customer's dye pots, mounted on a movable tray. Our internally custom designed software can handle our own recipe management or the connection to one external. 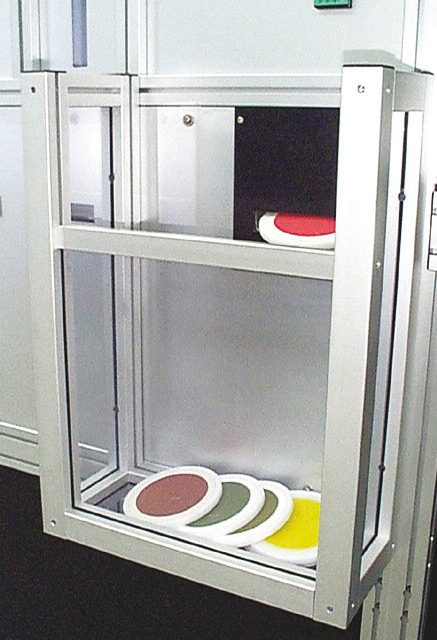 Free space of cm 30 widths X 100 cm length to locate the customer’s own beakers where the solution has to be dispensed. For example if the beakers have diameter 10 cm we can store 30 beakers, so we can prepare 30 recipes. Optional supply with PPA completed with further modules of 4 dyeing machines. The PPA will send the recipes into the kiers, each one quipped with its own pump and stainless steel frame. The SMP unit has been designed especially for sample dyeing machines with automatic dispensing of small quantities of dyestuffs and chemicals, typical of laboratory or additions to the production system. 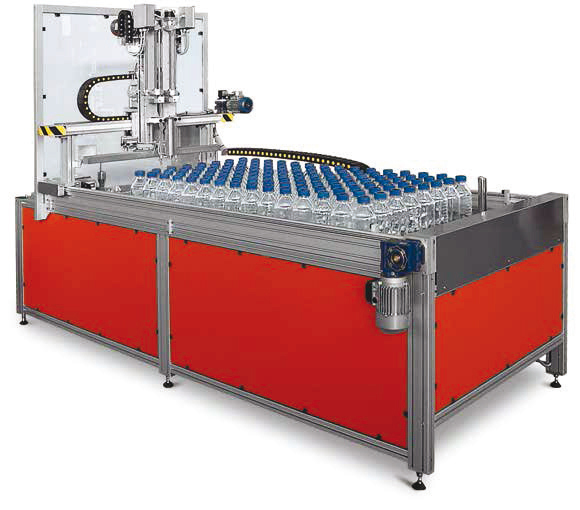 This is only the system can dissolve and dispense directly without using solution bottles. Powder dyes stored in mini hoppers. 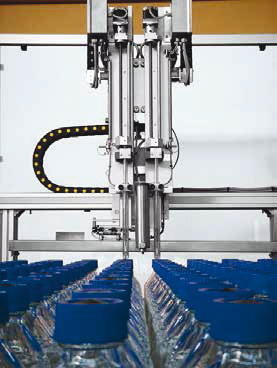 A handling robot carries a hopper to solution making position and weights dyes on high precision scale. Adds water and dissolves automatic depend on required concentration. Solution is transferred to stock solution bottle, which is cleaned simultaneously. 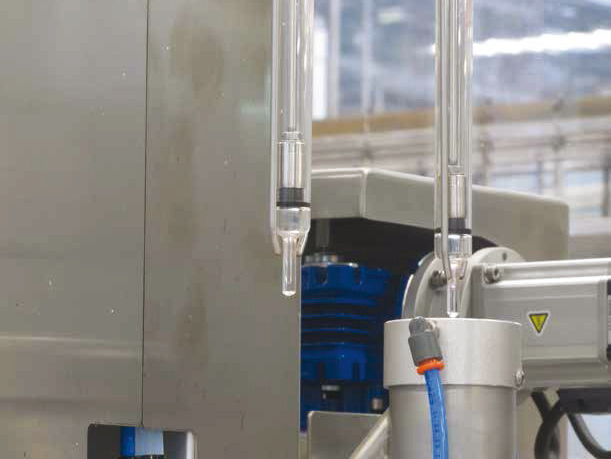 Robot carries back the bottle to original position to be ready for pipetting. When machine is pipetting one pipette, the other is free for washing. Washing time can be saved. Thanks to double pipette technology, calibration is very simple. It is very fast to calibrate just two pipets instead of multi-pipets. No stuck risk and easy to observe complete glass pipets. Also each pipet has 35cc capacity to serve many beaker in same time. 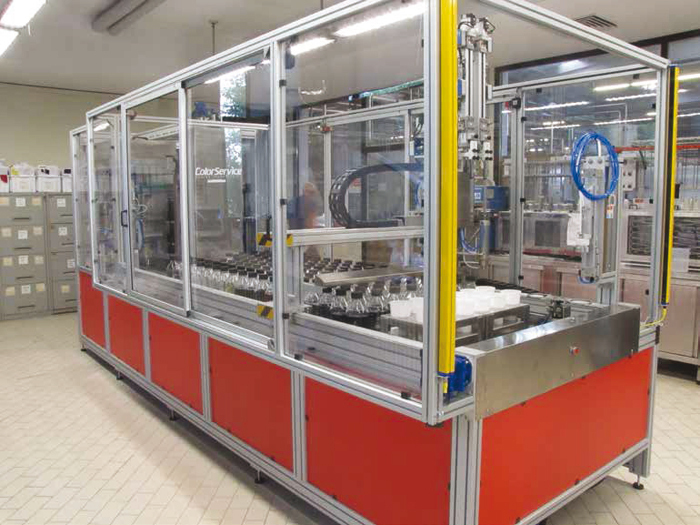 The progressive improvement of the dosing cycle, singularly for each solution. The accuracy of the dosing automatically improves. 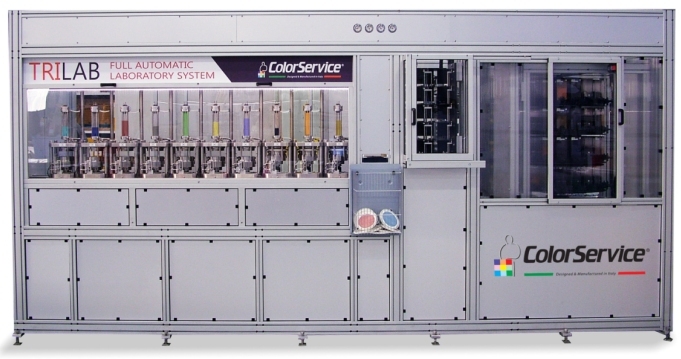 Machine can prepare final bath including all dyes and chemical to avoid mistakes and helps to save time for operators. For example 30 beakers in one time can be prepared average 10cm diameter of each. Water and other chemicals can be added in automatic. This is a big advantage to pipet any dye stuff immediately after dissolving. High concentration of dyes can be delivered without problem. Also machine does not occupy any bottle to do it. All fresh and all just in time. Another important key factor of TRILAB is the preparation of bath for conventional dyeing machines in lab. 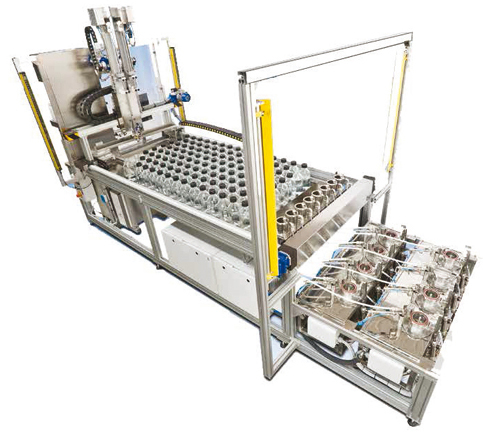 The pipetting unit not only serves integrated dyeing machines but also prepares bath into the dyeing beakers, which are supplied along with conventional dyeing machines. This is very important as only TRILAB system is enough for all kind of requirements. If dye house has pad-batch machine, TRILAB can prepare bath for sample. High accurate dosing unit is able to prepare high concentration dye bath, which is not possible for conventional pipetting systems. Dyers know very well that lab work is very important for pad dyeing. Actually there is no other possible solutions to repair color after dyeing is completed as well as it is not possible to get sample. Raw fabrics storage position. 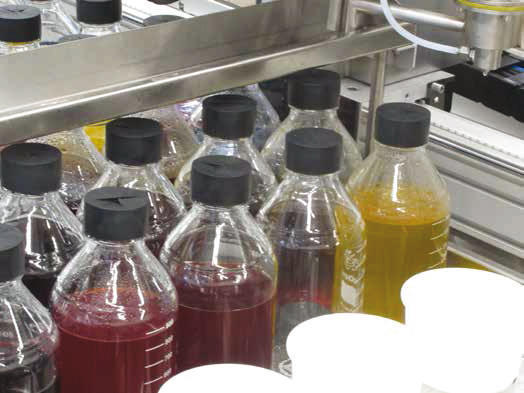 Dosing, dissolving, sending to dyeing units of auxiliary products. BASKET COLLECTOR FOR DRIED AND COMPLETED SAMPLES.